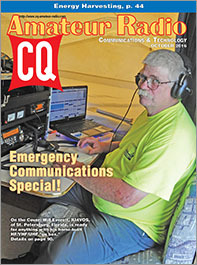 The October issue of CQ is our annual Emergency Communications Special, with a special focus this time on the versatility that amateur radio can provide as part of a larger emergency preparedness effort. We also have a "Morse Code Three-Pack" for our CW aficionados (as well as radio history buffs). 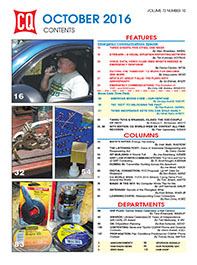 Our EmComm Special features include a report on how Ohio ARES® covered three major events in one week – including the Republican National Convention – that required operations in five different cities; the multifaceted emergency response that an EmComm team in Utah can provide to emergency managers; and how one club in Washington State is making good use of hams who have not had EmComm training but want to help when there's an emergency. 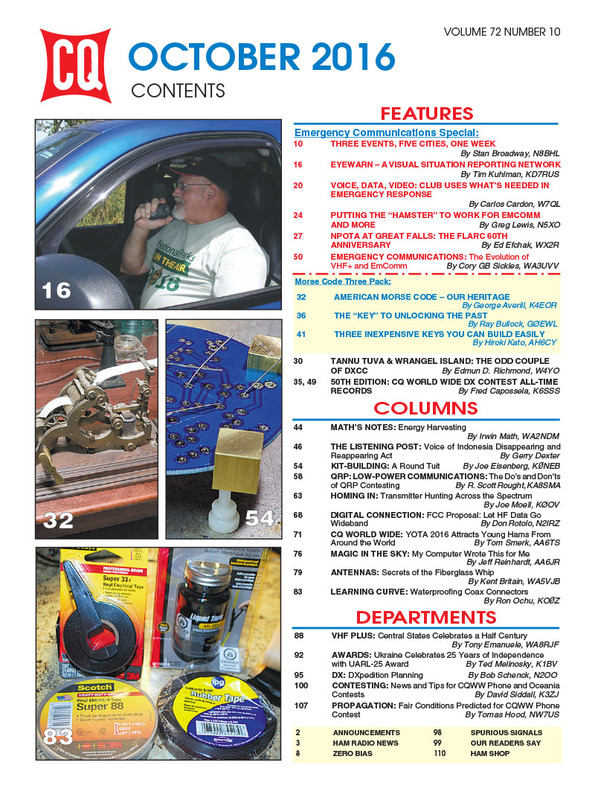 The "Morse Code Three-Pack" includes looks back at American Morse Code (used by landline telegraphers before the days of radio), the history of telegraph keys and a project article with three different keys you can build yourself. 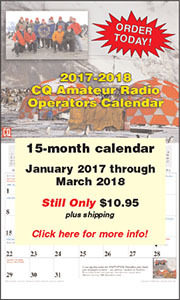 We've also got the 50th edition of the all-time records for the CQ World Wide DX Contest (SSB weekend coming up October 29-30; CW weekend on November 26-27); and our columns include a special edition of "Digital Connection," explaining why anyone who uses the HF ham bands should pay attention to the FCC's proposed rule changes regarding "symbol rate" of digital transmissions on HF. Finally, Propagation Editor NW7US predicts only fair propagation conditions for the CQWW SSB weekend. 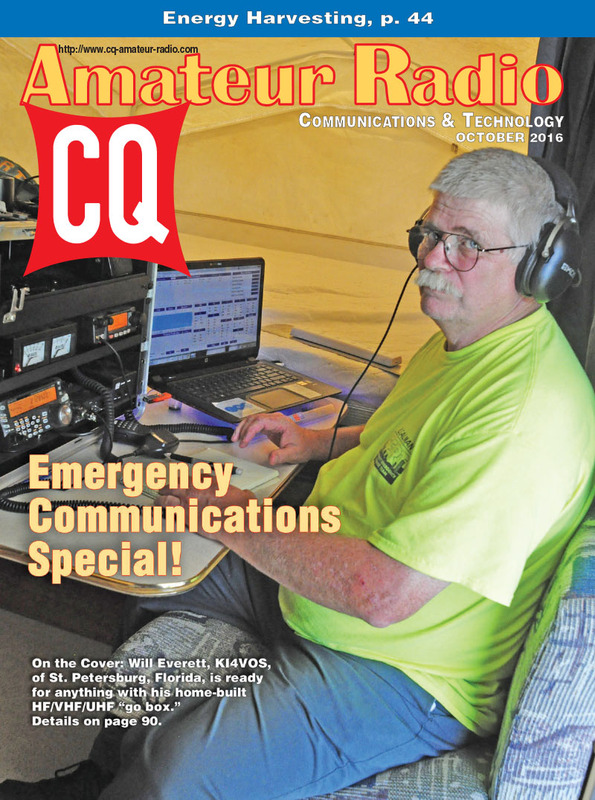 Zero Bias – "There You Go Again… "
On the Cover: Will Everett, KI4VOS, of St. Petersburg, Florida, is ready for anything with his home-built HF/VHF/UHF "go box."